DEBORAH CROMBIE: I can't say how many times I've read that reading while you eat is very bad for you. It distracts you from your food, so that you're not as aware of flavors, textures, or AMOUNTS. We should be mindful, and concentrating on something other than what's on our plate can impede digestion. BUT. We are all readers here, and I think we should 'fess up. When would I read my twenty-minutes-worth of the morning paper if not while eating my granola?? (And, yes, I still read a paper paper, even though I have a digital subscription.) And because there are always too many books and not nearly enough time, a half hour spent reading while eating lunch is a huge treat. And, oh, to go out to a coffee shop and read while having a cup of tea or coffee and a piece of cake or banana bread is heaven indeed! Hallie's absolutely perfect breakfast with paper. What about you, fellow REDS? If you are eating alone, and there is a book or a newspaper within reach, can you resist the siren call of print? JENN MCKINLAY: Guilty! I always read while eating or eat while reading if I'm alone. I read the newspaper (print here, too), whatever book I'm reading either in print, ebook, or even on my phone. When I was a teen, it was always cheese and crackers, a cut up apple, and a cup of tea. The only time I don't eat while reading is when I read in bed. Hub frowns on crumbs in the bed and I can't really argue the point. In fact, my post dinner read tonight is Sherry Thomas's A Study in Scarlet Women and I'm eating Ben & Jerry's Karamel Sutra - a perfect pairing. HANK PHILLIPPI RYAN: Well, sure! Breakfast isn't breakfast without reading the paper! One of my favorite things. When we are together, J and I read out out when we get to a good part. In a hotel? In the morning? 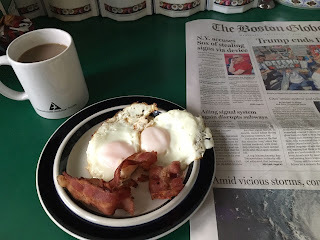 Breakfast with the local paper or USA today--fabulous. At Channel 7, reading/working is part of lunch! Now I'm thinking about whether it's unfair to the food and mindless eating. Hmm. How can eating bacon in a hotel room bed with a towel over your lap to keep the newsprint off the spread and crumbs off the sheets be mindless? But I agree, Jenn. No eating while reading in bed at home. Coffee, though. And yes, Debs. Coffee shop and paper/reading? The BEST. HALLIE EPHRON: I'm always reading when I'm having a meal by my lonesome. And I get the 'real' paper, too. At breakfast, I start with the Ask Amy, move on to the bridge column, then the weather, then the comics, the my horoscope. I leave the rest of the paper for lunch. House rules say NO READING when you eat with someone else (not because it's rude to the food, but because it's rude to the other person), so no reading at dinner. I usually eat and read standing at my kitchen counter. Because I sit so much working during the day, every moment I can I stand. RHYS BOWEN: For me it's an extra treat to be able to eat and read. After lunch to sit in the shade or lounge on my bed with an apple (nothing with crumbs, I promise) or a bowl of grapes or cherries and the book I'm reading. I don't read during breakfast. I read the newspaper online before I eat. But when I'm on a book tour I take a book with me to the dining room (if I don't have room service). Oh and of course a cup of tea has to accompany my reading as well! INGRID THOFT: If I’m on my own, I definitely eat while I read. I read the paper version of the New York Times during breakfast, but my lunchtime reading tends to be on the computer—catching up on sites like slate.com, boston.com, and seattletimes.com. I also like to read articles on longform.org. The problem this presents is crumbs in my keyboard, which sounds like the title of a country western song. When I purchased my current laptop, I vowed that not a bite would pass my lips while sitting in front of it. Fast forward a few years, and I think that might be a chip crumb by the “P” key. Oops! And Hallie, I always read “Ask Amy” and “Dear Prudence” on Slate. Nothing like enjoying my lunch while reading about the bridesmaid who spoiled the wedding or some such debacle! DEBS: No eating or crumbs in bed!!! And I try, I really try, not get eat at the computer, because I mostly work on my laptop and the keyboard is horrible to clean. But here's a logistical question about reading actual paper books while you eat: how do you keep the book open? I end up weighting down pages with jars or other books or my phone, none of which work very well. So I had a brainstorm and ordered a little easel. It hasn't come yet, but I'll report if it works. READERS, how about you? Who's guilty of indulging in book or newspaper when eating alone? If I’m alone, I absolutely read while I am eating . . . and there’s ALWAYS a cup of coffee close at hand . . . . I think it's interesting how many of us read a physical paper in the morning with our breakfast or coffee or tea. As I am usually here by myself, I can do so without interruption. But, even when my husband is here, he knows that I like to start my day that way, and he finds somewhere else to be. I do talk to him at other meals. However, since he has been gone for his work for so long and I am here alone, I read at most meals. I prefer a book or a magazine or a newspaper, but I have been known to, in my desperation to read something, read advertisements from the mail or cereal boxes. So far, Debs, I've used the TV remote or other semi-heavy object to hold the pages down, but I'm delighted with your easel idea. I may even have one like those in the picture here somewhere. If not, I will be ordering one. Thanks! Oh, and I've stopped eating in bed and reading, as I don't want to get food in the bed. I still read, and I still drink coffee or something, but I've broken my habit of food and bed. Oh, and I think your breakfast is perfect, too, Hallie. And, I have to note something that I was talking to someone about today. My husband and I were maybe going out to eat with a couple (didn't work out), and the last time we went out to eat, the woman brought her knitting with her and knitted while we sat at dinner. I was thinking I might just bring a book and read while she knitted. Hehehe! I wouldn't do it, but I did think, if she can do something like knit, I should be able to read. I know, it was a crazy thought. I think when you're having a meal with other people, phones and other points of distraction should be off limits. But when alone, oh sweet reading! The difference between needlework and reading is that with knitting or crocheting, your hands and eyes are busy, but your brain and ears are free to focus more closely on the conversation. I frequently take a crochet or quilt piecing project to rehearsal, because I want to listen to the music and learn it. Having something mindless to do with my hands and eyes lets me really listen and absorb what the band is playing. Otherwise I go to sleep. Gigi, I agree and I really know that it's way different for someone to knit at a dinner than read. I wasn't serious about thinking I should be able to read at a dinner out. However, I do think that bringing one's knitting to a dinner out is rather odd. Taking knitting or crocheting other places seems fine, but a couples' dinner out, not so much. With you all! Always reading when I'm eating alone, and at lunch it's at least one of our two daily papers (I no longer eat breakfast, and I bring my coffee to my office to catch up on the internet before I start work at seven). I don't consider it being guilty that I sometimes read while I eat. It is simply just a part of what I do. I usually read while I'm eating lunch at work. It could be a book, or a copy of Sports Illustrated or Classic Rock magazine. I've gotten into the habit of carry something to read wherever I go so if I get hung up, I have something to keep me occupied. When I go out to lunch at the 99, I bring something to read while I'm waiting for my food but I usually just focus on the food once it is in front of me. Dinner at home will usually be while I'm watching TV so there isn't a lot of reading done then. However, as a slight aside to the topic at hand, I usually do read when I am just watching TV. I read during the commercial breaks. I read books on my phone! It's pretty great . Do you do that? Isn't it great, to find out you've been with "your people", all along? It's comforting to know how many of us read at the table. When Steve and I married we were both in our early thirties, and we'd both been single a long time. He majored in English at Brown because he loves to read so much, so we were soulmates from the very beginning. We simply continued our habit of reading at meals, just companionably together instead of alone. We have conversation, too, but we eat together twice a day, most days. All three of my daughters were reading by the time they were four, I always say it was out of self-defense, and my grandson, too. When the two younger girls were in high school they sometimes studied during meals; Robin's favorite spot at the counter always had a pile of textbooks. I often helped drill her in Latin or some other subject way over my head while I cooked. But no eating in bed, ever. Food of any kind is verboten on the second floor of this house, one of my firmest rules since I found a moldy sandwich under a pile of clothing on the floor of my oldest daughter's room. It's better for my allergies to have a cleaner sleep environment, too. Toast crumbs in the keyboard, Ask Amy, Dear Prudie, Hax and Miss Manners (Washington Post on-line). I read hardbacks at the table during lunch and if I'm alone, dinner, propped on a stack of books and weighted with pottery coasters. Hax recently published her annual wedding write-in, which was hysterical. I read Carolyn Hax, too, and Miss Manners on occasion. They always makes me so glad my wedding is far behind me! I almost always read if I'm eating by myself. I mean, come on. What else am I going to go - stare at the wall or my plate? Guilty as charged, crumbs in the keyboard and all (a good shake upside down, a toothbrush and a computer wipe usually get the keyboard sparkling clean). No food in bed, but anywhere else, any time, with any reading matter is perfectly acceptable here. It's not a rule, but, come to think of it, when we eat together, we're talking. We gave up the physical paper when we made our recent move. There are days when I'd like to have it, but overall I don't miss it that much. After being bought by one of the conglomerates, it had become McNews anyway. At first I didn't understand the question, but I guess what you're suggesting is that there are people who eat alone and don't read? Hard to imagine. I tend to alternate between periodicals and one of my current books, depending on what's new and shiny in each category (or if I have a deadline). I sympathize with the problem of keeping a book open--I usually pur something fairly heavy across the pages. Debs, I'll be interested to hear how you like the easel. I'm so used to reading something that's laid out on the table that I'm not sure how I'd do with something standing up. Zoot alors, I never eat in bed. READ, yes. But I do think it's interesting how many (most?) of us have lost (never had) the ability to let our brains rest. I sit waiting for a doctor's appointment and take out my phone. Check headlines. Any meditators out there? Because I think I'd like to learn how to just BE. I meditate every now and again, and it's a good discipline to cultivate, I think. I don't like to be caught out without a book, but if I am, or even if I'm just super-stressed in work or home life, being able to take a breath, ground myself, and be here now is an excellent skill to have. Sometimes we spend much too much energy avoiding life, rather than living it. I try to meditate for a short while when I get home from work. Then out comes a book! Hallie, you have made such a great point about how hard it is to just "be." I have found myself in such a peaceful, lovely place when I am doing something like watching the bunnies out the window and allowing everything to just fall away. I need to do much more of that. I meditate daily, Hallie. There is a form of meditation called "working mindfully" Basically it is focusing on the task and not day dreaming. So washing dishes is washing dishes. You are right tho..multi-tasking is in vogue. Weren't our computers supposed to help us think more clearly and not promote instant ADD? Is meditating the same as napping? If so, I am an expert! If I sit and don't do anything I fall asleep. Unless it's bedtime. Of course. Personally, I do not eat while reading. It's exasperating when I borrow a book from the library and I see chocolate stains on pages! I can smell the chocolate on the pages so I need to take a dry piece of paper to clean the pages! However, when I eat in a restaurant, I do bring a book to read while I am waiting for my food if I am alone. Once the food arrives, I put my book in my bag. Diana, a woman in our book club also thinks it's a vile habit, and she gets repelled by library books with food stains. Karen, what does she do? I just clean the pages before I read the books with Kleenex. No chemicals. I do not want to attract ants. LOL. Read while eating? Other than right now, you mean? Of course I do. I buy a new purse based on whether or not it's big enough to hold a hardback, and take reading material with me everywhere. And I feel no guilt--except for maybe a tinge when I tell the co-worker I usually eat lunch with that I have personal errands to run, when really all I want is enough time alone to finish the last fifty pages of my current read. I did that yesterday, gobbling down the end of Hank's terrific "Say No More" much faster than I ate my sandwich. When it comes to the news, I split the difference: Dallas Morning News on paper; New York TImes and Washington Post on my tablet, usually before I crawl out of bed in the morning. But going straight to the good stuff, Hallie? How decadent! I skim through the hard news before I get to the soft, nougat at the center. It seems wrong, somehow, to blow off Hurricane Irma in favor of Caroline Hax. Probably some misplaced form of the Puritan work ethic. I'll work harder to follow your excellent example. And no crumbs in my bed, of the bread or even the human kind, although I can't vouch for what the dogs bring with them. They eat the strangest stuff. The other day I found a deer antler under the covers! I loved eating and reading. It's one of my great pleasures in life, actually. I'll often go to restaurants with a novel to relax. As a teenager, I looked forward to getting home after school and decompressing with a snack and a novel (usually pilfered from my mom's paperback bookshelf). Lisa, if I could read and eat without spilling food on the pages, then that would be great! Wish I was more coordinated. Admittedly, my books do have stains on some pages. But I'm careful with library books! It's good that I'm not sleeping with any of you because I eat wherever I read and read wherever I eat. So shoot me. I read on my computer during breakfast and then put the machine away for the day. However today I got a late start, barely finished my coffee, which comes before eating, when the PT arrived. I had to put down my cup and my computer for an hour of exercises, so now it is ten almost, and I haven't had breakfast yet. Or finished with Jungle Red. Sigh, life is so complicated. At night I always have a yogurt and two graham crackers and a book on Kindle in my bed. I am careful about crumbs, but seriously, when I have two dogs in bed with me, the crumbs get vacuumed up anyway. Not a problem. I also avoid crumbs on the computer, somehow, someway. I rarely read a print book, and if I do, chances are it's a signed first edition, so with those I avoid eating or drinking anything. Have to keep them nice for after I go and my kids throw them all in the bin. "Have to keep them nice for after I go and my kids throw them all in the bin"
You made me laugh out loud Ann. So true. So it is established that pretty much all readers and eaters do both at the same time. I do avoid eating when I am at a sit down dinner for 12, but that's only because I probably did the cooking and am gathering in the compliments to the chef. Ann, thank you for all the days that reading your words has made me smile, feel a little warmer of heart, and to believe a little more in goodness. Not to be intrusive, but I'm sending an electronic hug. When alone, be it home or restaurant, I always, always, always read. It slows me down. I'm captivated by a story and I stop eating which then reduces my consumption of food. In answer to Debs question on holding a book upright...A plate stand. For my arthritic hands, I have a laptray on hinges I can raise and lower. I seem to fit with the mainstream here. I still start the day with a physical newspaper while I eat my breakfast. Most days, I read a book while I eat my lunch. If my husband and I dine together I don't read, but if I'm alone, I will usually either read or put something on the TV. I think there is something to Hallie's observation that we as a society have lost the ability to just BE, though I don't find it strongly correlated to reading while I eat. (I've done that since I was a day-dreamy young girl.) But reflexively turning to my phone when I'm waiting in a queue anywhere? That feels a wee bit pathological at times. And I know most people use headphones while they walk or run these days, but I have resisted that, on principal. I try to keep anytime I walk alone as one time when my head must keep its own company. I read The Lion, The Witch, and The Wardrobe when I was about 9 or 10. It was Christmastime and Mom made some kind of sticky candy individually wrapped in wax paper. I remember reading that book and unwinding the wax paper and eating the candy with one hand while I held my book in the other. Good memories. What a lovely memory, Pauline! I love to eat while reading. When the Deathly Hallows came out, I picked food that would only require one hand so I could keep reading that heavy book! Also? I am a huge fan of Ask Amy and Dear Prudence! I eat on my lunch hour every day, but that's just a sandwich. Usually, I'm eating dinner while watching something on TV, so other than lunch, I usually don't eat and read. I read while eating and didn't know there was anything controversial about it! I also read in bed, in waiting rooms, on trains, etc, and pretty much anyplace where I happen to be alone. I read at my sister's bedside when she was dying, if she needed to nap. I always have my Kindle with me, if not also a print book or magazine. Someone who used to work in my building read while walking on her lunch break. With my tendency to trip over air molecules, I have never been brave enough to try that! I haven't been able to find a painless way to hold a book in my hands while eating, so I either put up with the pain or read from the Kindle. No eating in bed, though. I read every chance I get. I don't read if we are physically sitting at a table, eating a meal, and it's the two of us. Me alone? Absolutely. I read the newspaper (real one) daily but not necessarily in the morning. Abby, Miss Manners, and Heloise. Our paper doesn't have the others mentioned. Crumbs in the keyboard? Sometimes....... That has me humming clouds in my coffee from You're so Vain. I rarely read in bed anymore. It disturbs my grumpy husband so that remains a luxury for when he is out of town. I eat lunch at my desk almost every day because I don't get paid to eat. My boyfriend and I usually read when we eat lunch together at home. It's easier for him because he listens to audio books with a pair of headphones. But I'll read unless it's a really messy lunch. Other meals I only read if I'm alone. I eat breakfast with the Jungle Reds, have lunch with NYT and dinner with the TV. I do eat in bed as long as it is non crumby -- things like celery or peanuts. I am so happy that others also read the agony columns.. we really are a like minded crew, yes? Celery and peanut butter, my favorite vegetable. Coealee, we feel honored to be your morning read! It all started when I was just a little kid, reading cereal boxes at breakfast! You know I have a theory: some non-reader (sorry to say there are a few) started that whole myth about poor digestion, etc. Seems if I am reading the paper while I have my lunch, my eating is much more leisurely and that must be more conducive to good digestion! Yes!! I used to read every word on the cereal boxes, too! One of my favorite places to read is the bathtub. It can be dicey if it's a heavy hardcover, and I don't like to take signed books near the water, but everything else is fair game. I even use my book light. Can you get electrocuted by a book light battery in water? I love to read, especially fiction, with my breakfast. If I'm close to finishing a book at night, I might save it for the next day so I don't have to start something new while I'm not quite awake. For those of you who write series, one advantage for me as a reader is that it's not so brand new in the morning. I'm quite comfortable starting another book in a series at breakfast, whereas I don't generally like doing that with a brand new book. Living alone, I read every free time I get, including every meals. Debs, I use double clip at the corner of book to keep it open while reading during a meal. It works better if the book is not too thick. 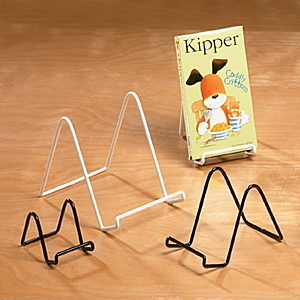 Danielle-momo, I got the little wire stand I ordered, and it didn't work at all!! Will try your clip method. Yes, I also read during my dining alone meals, but no eating in bed! There are many bookstands and things to hold your books open, Debs. Google "device to hold your book open," and see all the things that come up! Or, try "bookstand for reading." "Bookbones" come in different colors. A day late, but had to answer this. Read while I eat? But of course! Newspaper (hard copy, delivered to my front steps, a cheap luxury I started when I was home with babies) over breakfast, shared with husband. (It's the NY Times so lots to share) Working at home now, so more newspaper, or current book, or magazine or - I admit - catalogues over lunch. Dinner too, if I am alone - husband and I often on different meal schedules. An odd and not great side effect; since my necessary meals are a break from work, it's "ok" to read. And if I want to keep reading, I seem to feel obligated to keep eating! Also, I noticed how many commenters mentioned advice columns and I wonder if the attraction is that every single letter seems like a very short story. I share it, read Hax online and used to love Miss Manners wit and common sense. A little late, but I had to comment. Reading and eating are my two favorite activities, and they just pair together so well. It's gotten to the point where it's like Pavlov's dogs: If I'm reading, I get hungry and need to make a snack. If I'm eating, I feel the urge to pick up a book or find something to read on my phone. Match made in heaven, as far as I'm concerned.